Lace wig care (as well as traditional cap wigs and monofilament cap wigs) is key to making your lace wig last, so here are 10 easy steps to follow in order to wash, condition and dry your wig, whether it's a lace wig, traditional cap wig or monofilament cap wig. 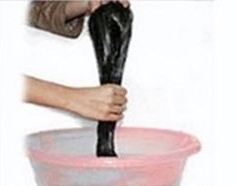 The information is broken into stages and is not texture-specific, so if you have a curly wig then use the upright washing method and if you have a straight or lightly wavy wig, you can use the sink washing method. If you wear your wig every day then washing it once or twice a week with cool water is fine. If you go swimming then always wash the hair afterwards with a clarifying shampoo. 1. Before washing the hair, use a wide tooth comb and comb from the tips of the hair upwards slowly to detangle. Always start combing at the bottom and not the middle or top to avoid breakage. 2. 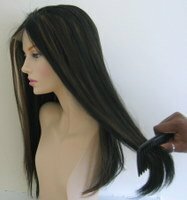 Place your full lace wig on a Styrofoam wig head and use pins to secure it and spray water onto the ends working your way towards the cap until the wig is completely wet. The gradual way of getting the hair wet is to avoid tangling especially if it’s a curly textured lace wig including Afro textured wigs. 3. Washing: fill a spray bottle with a capful of shampoo and water. A shampoo for dry or coloured or chemically processed hair is fine. Use shampoo for coloured hair if your wig has been dyed. If you choose to use brand name products this is fine but not necessary as you are just washing (removing dirt and build up) the hair. 4. Spray the mixture onto the hair and using the wide tooth comb, comb the hair starting from the tips working towards the cap to distribute the shampoo. Rinse by pouring cool water over the wig. 5. It’s advisable to deep condition your wig at least once a month but once every two weeks is ideal. If you’re able to deep condition at least twice per month, you're unlikely to need leave-in conditioners and this will preserve the hair as conditioners by their nature, dry out hair and dry hair can become brittle. 6. Deep Conditioning: spray the conditioner onto the hair – use the wide tooth comb to distribute, place the wig in a plastic bag and wrap in a heat pack. Place a towel around the heat pack and wig and leave for 30 minutes. 7. Rinse the wig by pouring cool water over it. Optional step - use a hair oil to seal in any moisture that was lost through deep conditioning the hair. 8. Squeeze the hair but don't wring it; then towel dry the hair by blotting but not wringing the hair. Pin the wig on the Styrofoam (polystyrene) head in order to allow to air dry. Curl and wave patterns become distorted when the hair is dried flat. Always hang or stand deep wave and curly human hair wigs to air dry in an upright position; this is essential for retaining the uniform wave and curl pattern. 9. If you have a curly or wavy wig, you should moisturize the hair whilst it is damp – the moisture from being washed will be sealed in to the hair by the oil which will keep the hair lubricated and soft. 10. If you’re not moisturising the wig, then leave to air dry or use a hair dryer on a low setting. Heat damages hair so air drying or blow drying cold is best. If you really prefer drying with heat then using a thermal protection spray or serum will help reduce any heat damage. As part of your lace wig care regime includes how you style your hair, you can check out the guide about styling tools and methods for your lace wig and traditional cap wig. That's a wrap on universal wig care. It's not just about wig care; Maybe you wear other types of hair too and if that's the case, there are guides about caring for hair weave and maintaining clip-in hair extensions as well as a series of guides about caring for micro ring hair extensions. There are also Q&A sections like our Hair Extension Q&A section and Lace Wig Q&A section; and if that wasn't enough, you can use the navigation menu as well as the option to keep up with our guides and articles about hair extensions, wigs, weaves and hairpieces by joining our blog which is super easy to do and doesn't need personal info - yay!